ex24 WAS PREVIOUSLY REGISTERED WITH THE U.S. SECURITIES AND EXCHANGE COMMISSION(SEC). ex24, with its technology platform written in Java , managed by its majority shareholder as CEO, previously operated as a Person to Person, 24/7, broker-less, major stock trading and settlement system. 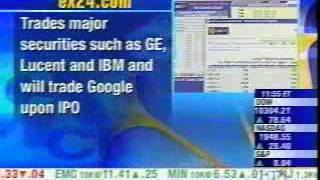 ex24 was an SEC registered Alternative Trading System(ATS), operating as a Self Clearing Broker/ Dealer. Because of a rule, limiting trades to 99 shares per order, from which ex24 unsuccessfully sought exemption, the system was shuttered as unprofitable in 2006 after a cash investment of more than $9 million by its Founder, James P. Lennane. ex24 traded solely in large cap Listed Securities. It closed its operation with a flawless record. Mr. Lennane now proposes to become the U.S. premier, SEC registered, Title III Crowdfunding issue support system, a Title III Crowdfunding trading platform, a transaction settlement system, and a stock holder record management system. Initially, ex24 will conduct Funding Portal activities. However, after proving its core system, ex24'a long range goal is provide a full service initiation and initial funding services to SEC Registered Broker/Dealers Funding Portals and Title III Crowdfunding Issuers thus relieving them of the detailed burdens of an SEC Regulatory compliance for Crowdfunding by an Issuer. Further ex24 will perform the stock records maintenance and transfer services to Issuers once the Issuer's Crowdfunding is completed. Subsequent to Title III Issues having passed through the mandatory one year holding period, ex24 will provide a complete trading platform for buying, selling and selling the previously issued Title III securities in a safe and secure already proven environment..
ex24 will use the proceeds of the offering to apply to be registered with the SEC as a Self Clear Broker/ Dealer that will be permitted to carry Customer funds and Securities. James P. Lennane(JPL), 74, is the Founder of ex24, Corp and its predecessor ex24, Inc and its parent. JPL has been a life long entrepreneur and self employed since 1964. His prior experience included the founding of System Integrator's , Inc(SII)(NYSE-SIN) with less than $50,000 in Capital. SII dealt with large scale publishing and wire service systems based on fault tolerant system. SII was sold in 1989 for more then $125 million while it was listed on the NYSE. JPL was its CEO and major shareholder at the time of the sale. in the prior incarnation of ex24, he was its CEO as well as principal shareholder and provided over $9 million of cash capital to ex24 and its parent. While managing the prior ex24 he was registered with the NASD as a Series 7/24 representative.